The Harrington Hall is an award winning hotel. It is the proud recipient of the Irish Tourist Board 4 Star, AA 4 Star, RAC 5 Diamond and RAC Sparkling Diamond awards. The excellent personal attention and the beautiful calm relaxed atmosphere will make a stay in The Harrington Hall an experience to remember forever. The management takes great pride in the quality and expertise of their staff and has now added several new highly qualified members to the team. Completely refurbished and still retaining most of its Georgian features the hotel offers thirty magnificently decorated en suite rooms. They offer standard guest rooms as well as some junior suites. Every facility necessary for comfort and convenience is available to the guest. Facilities include direct dial telephones, optional fax facilities, modem ports, remote control multi channel televisions, tea and coffee making facilities, hairdryer, no smoking rooms, babysitting/child Services, sound proofing and air conditioning. There is also parking, laundry/valet services, and conference room and business facilities. And in addition the friendly staff are always available to advise the guest on all the beautiful sights that Dublin has to offer. The hotel's restaurant is the place to eat and drink in style after a hard day shopping, business or sight seeing in our beautiful capital city. The restaurant provides both a la carte and table d’hote menus and all food is lovingly prepared and presented by highly trained personnel. A full Irish breakfast is included in the basic rate for each guest to provide a hearty start to the day. 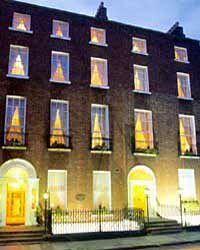 The hotel is situated on Harcourt Street, just a short skip from St Stephens Green with its beautiful park and shopping centre. Grafton Street which is famous for both its shopping and buskers is close by. Most other tourist attractions are also close by and The National Gallery, Government Buildings and The Natural History Museum are well worth a visit. As is Trinity College the oldest university in Ireland and there you can see the beautiful Book of Kells and the old library.